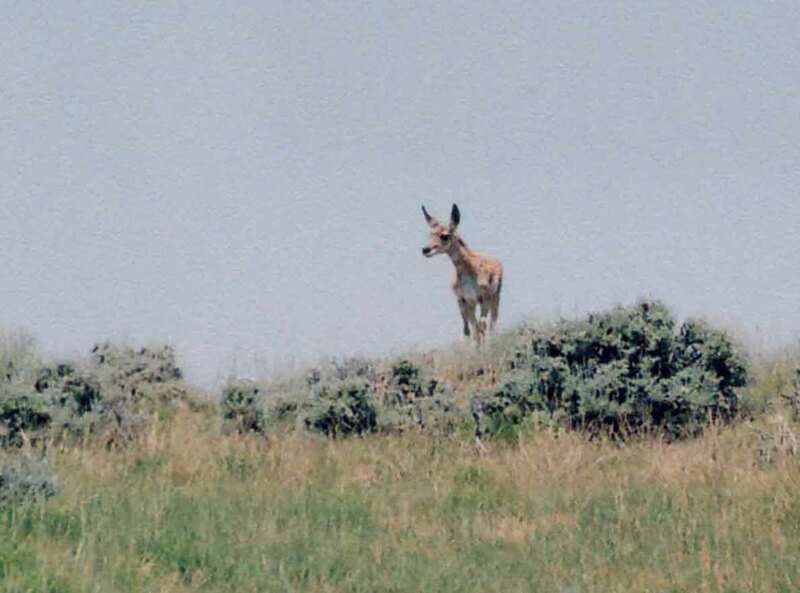 This month I am covering a species that is found in abundance in Wyoming--the pronghorn antelope. I have no references or research notes as I am writing from 25 years of observation. Pronghorn antelope are often called antelope, but are not true antelope. They are the last remaining species in their biological family. 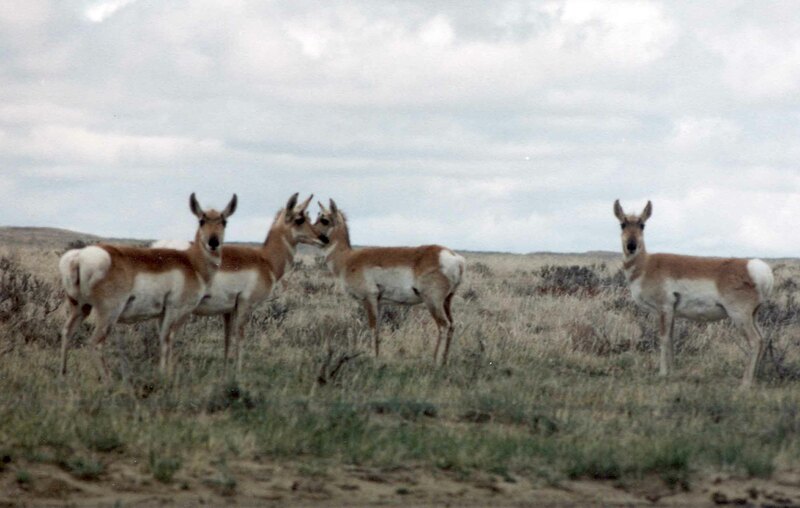 Pronghorns are found in a band through the western United State reaching from Canada to Mexico. Wyoming has a very large population of pronghorn antelope--when I moved here over 20 years ago, there were more pronghorns than people. That may still be true today. Pronghorns most distinctive feature, as far as I am concerned, is the speed with which they can run. When antelope run, they get lower and lower to the ground, stretching as far as they can with each "step", and they run with their mouths open to get as much air as possible. 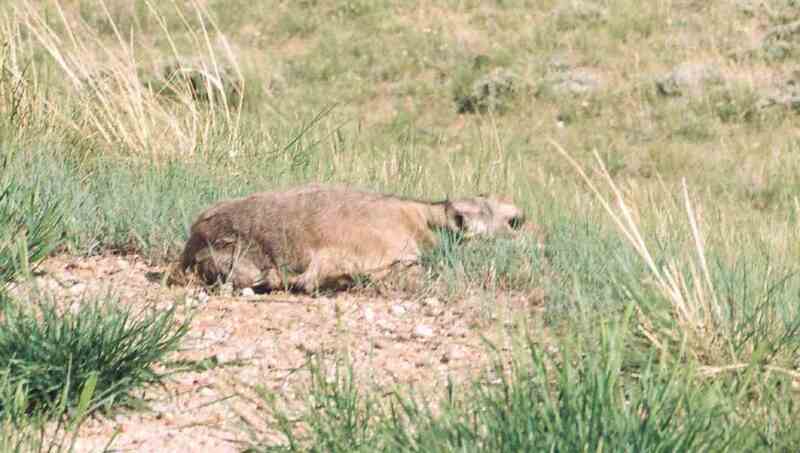 These animals can run up to 60 mph--I have seen them run alongside the road and keep up with my car at 50 mph. Running is their only defense, as far as I know. Whenever antelope are frightened, they run. As far as I have observed, they run in whatever direction they are facing--at least to start with. This requires that they live in areas with open spaces and little fencing. However, the animals do appear to be able to modify this behavior. Pronghorns are seen further and further into town, grazing on lawns and walking down streets. As they become accustomed to people and the sounds of an area, the running behavior decreases. In addition to living further into towns, the antelope have begun to learn to jump fences. This is not a "natural" behavior. Twenty five years ago, you rarely, if ever, saw an antelope jump a fence. They will "scoot" under the fence, which is why ranchers and those on antelope migration routes are asked to put up fencing with space underneath (a foot or so of clearance) so the antelope can go under. Now, it is not that uncommon to see an antelope jump a fence, especially in areas with both deer and antelope. I suspect the antelope "learn" from the deer how to jump the fence. I have no proof of this--just a theory. 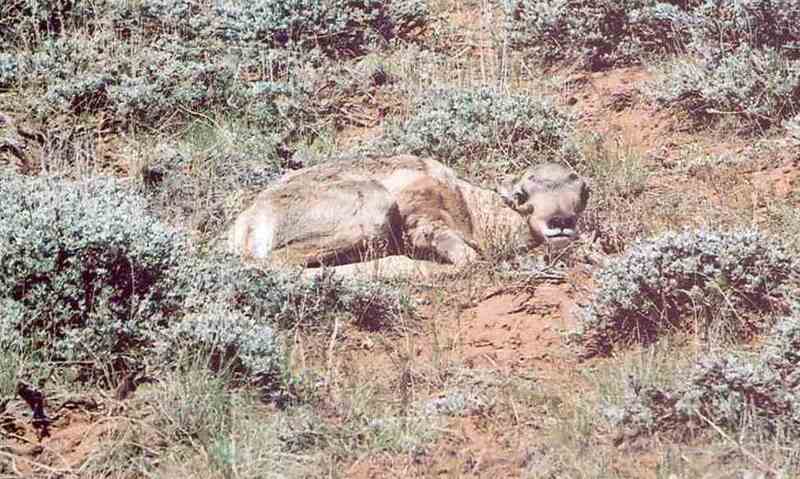 Pronghorn antelope breed in the fall. 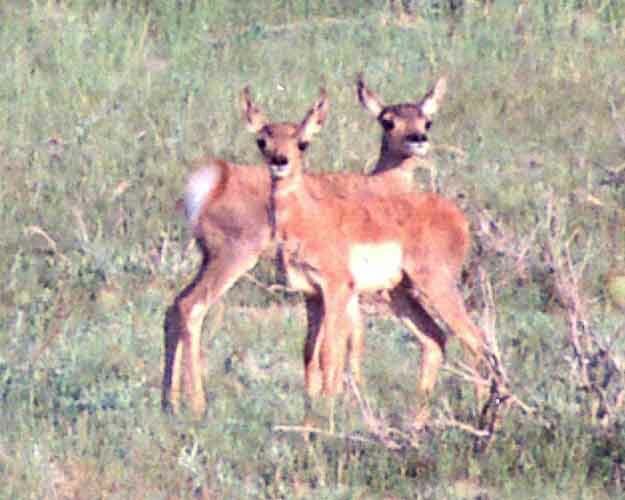 Unlike deer, elk and moose, I have not seen buck antelope "sparring" during mating season (known as "rut"). The males will mark territory (pee on the ground in one place to mark the area as theirs) and they "scratch" up the ground in the same area. Mostly, the males round up the females into large groups, kind of like their own personal harem. The males will chase and bring back to the group females that try to leave the harem. During this time, you will see small groups of younger bucks banding together (those too young or small to compete with the older, larger bucks) and often you see lone bucks wandering the prairie solo. After breeding season, the antelope will begin to form large herds and migrate to their winter feeding grounds. Many areas of Wyoming are too cold and snowy for the antelope to stay in during the winter, so there is a fall and a spring migration. More care is being taken in development to make sure these migration paths stay open for the antelope. If the paths are blocked, the antelope may end up dying due starvation. When I moved here in 1982, the winter was harsh and I could count the number of antelope that died at fences each day when I came home from work. It's one of the reasons I hunt antelope. Watching them die a long death at the hands of winter may be "natural" but a quick death by hunting seems far less cruel. Antelope have one to three fawns each spring. This appears to be based on age (younger does have one fawn) and on the severity of the winter. After harsh winters and long droughts, you see mostly twins. Triplets occur more after mild winters and during normal rainfall. The fawns can run very soon after birth. When too young to run, especially for long distances, the fawns "flatten out", much as rabbits do and lie motionless. The mother antelope will run away, leaving the fawn, and hopefully lure any predator into chasing the mother. This often leads people to think the mother has abandoned the fawn and they try to "save" it by taking it home. The mother has NOT abandoned the baby and is probably watching from a distance. The fawn will be fine and should be left where it's lying. Antelope have incredible vision--they can detect movement at very long distances. This is why the doe can be far away from the fawn and still see what is happening. This ability makes hunting antelope or getting close to photograph them very difficult. When the weather is windy, as it usually is in Wyoming, the antelope are even more skittish. The same is true for snowy or rainy weather. I think the noise and low visibility makes it difficult for them to know whether an approaching person or animal is a predator or not. When the weather is clear, it is possible to approach more closely. Walking naturally toward the herd works best--if you don't look threatening, the antelope are less likely to fear you. 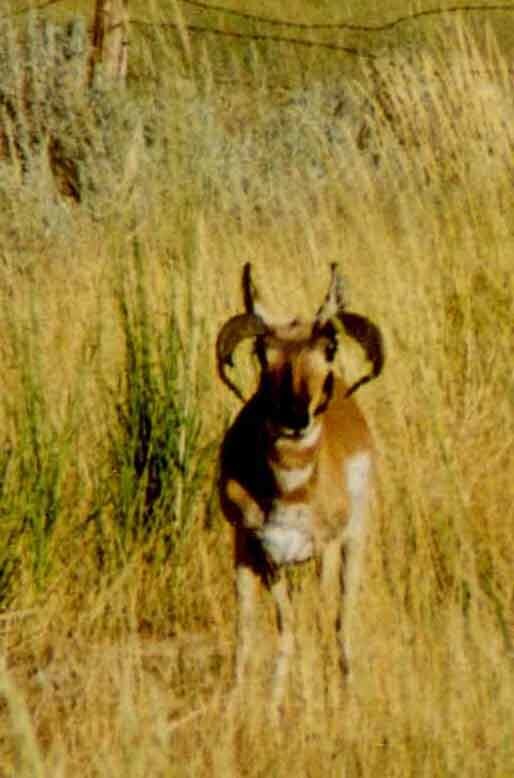 Generally, it is best to view antelope from a blind (inside a building, inside a car--interestingly enough, antelope will walk right past a car with people in it, if the car is sitting still, behind sagebrush, etc) if you want to observe them without frightening them. 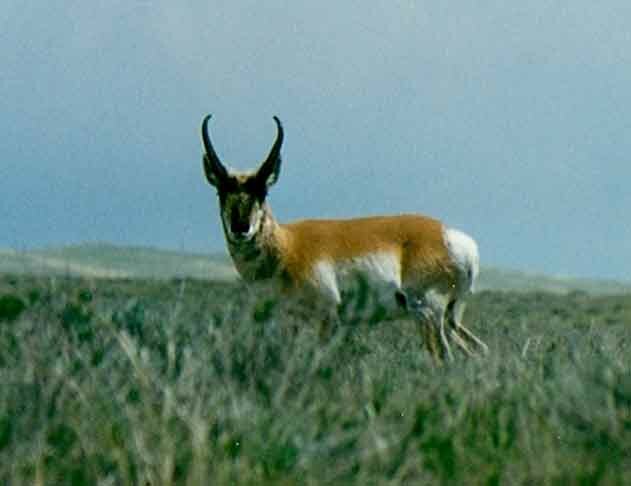 Pronghorns are a unique animal. Hopefully, increasing population and the associated roads, fences, wind farms, oil fields and so forth, will be constructed in ways that don't significantly reduce the numbers of these animals.